Remember when you were young, and Valentine’s Day meant your parent or grandparent helped you make cupcakes or cookies and you had to make sure you had something for every person in your class? And the most exciting part was wondering if your crush picked out that Teenage Mutant Ninja Turtle card especially for you?!? There are times when I wish things were that simple again. As an adult, this particularly odd February holiday can be stressful, for singles and couples alike. Regardless of how you feel about cupid and his arrow, our city has something for everyone – from gourmet chocolate to local wine to insect feasts that include our tiny friends in both food and beverage, (Yes, it’s a real thing! The Atlas Obscura Society Valentine’s Insect Feast is on the 14th at Darrell’s Tavern in North Seattle) if you can’t find something do to, you’re just not trying. Seattle, Washington beckons travelers to its vibrant city limits in droves each year. While it’s an exciting place to visit year-round in the name of urban entertainment, outdoor adventure and delectable dining, February 14th transforms the Emerald City into an oasis of love and romance. It’s hard to find a better place to spend time with the one you love most with opportunities to indulge in the language of love lingering on nearly every block. 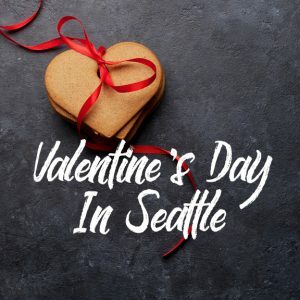 Here are the top 4 reasons you’ll want to spend Valentines Day 2019 in Seattle. There’s nothing like chocolate to set a romantic scene. A stay in Seattle over Valentine’s Day is best experienced when it includes a trip to Seattle Chocolate. This combined flagship store and chocolate factory is a tasty icon of the Pacific Northwest that encourages guests to indulge in local melt-in-your mouth flavors. Pick up a variety of chocolate delights with the understanding that they are best enjoyed when shared. Take a tour of the factory to see how these delicious creations get their start, then spend time enjoying truffle bars until your heart is content. Even more, guests get to keep spreading the love well beyond Valentine’s Day with a portion of every sale going directly back to local food banks. While a day at the spa holds the potential to turn everyday into your best day, Valentine’s Day calls for a spa experience that brings an inclusive touch along with the luxury. Tucked inside the Fairmont Olympic Hotel is The Penelope and Beauty Bar. An ideal Valentine’s Day destination in Seattle, this spa carries some of the most exclusive brands on the market while offering up wonderful couple’s massage options. Take time to relax in style but more importantly, together when you book a session at this lovely locale. Haircare, waxing and skin treatment services are readily available for those couples looking to indulge in a day of pampering as opposed to a few hours. While any other day of the year may categorize a tourist-heavy stop as standard, visiting the top of the Seattle Space Needle on Valentine’s Day comes with an element of romance that’s hard to resist. Make your way up to the observation deck to enjoy panoramic views of the city and surrounding waterways from an incredible vantage point. Away from the bustling crowds below, you’ll find an intimate moment to cuddle close to the one you love and soak up a view unlike any other while you’re at it. If the language of love is best spoken through delicious dining opportunities, then Seattle is the perfect place to be on Valentine’s Day. A reservation made at Cascina Spinasse is sure to inspire love and a pleased palate. This upscale restaurant complete with elegant lighting and a rustic ambiance will leave you feeling as if you’ve been swept away to the Italian countryside in no time at all. Serving up Prosciutto, Capunet and Trota in style, guests have endless opportunities to enjoy hand-made pastas alongside a meticulously curated wine list. Fashionable and flavorful, Cascina Spinasse is the ultimate Valentine’s Day destination when it comes to fine Seattle dining. When you’re here in the name of romance, make sure the team at Seattle Oasis Vacation Rentals has you booked in a beautiful downtown location. We’ll keep you close to the venues that speak to a celebration of love while providing unsurpassed views as the city comes to life during the day and well into the night. Contact us to start planning your Valentine’s trip!